Richard Shaw, producer/director of ‘Torah Codes: End to Darkness’, discusses some recent codes found by Rabbi Glazerson regarding Raymond Elwood Howard Lear who believes he is The Returned Christ, Isa and Moshiach Lord RayEL, Ra-el. In this episode Presenter Derek Gilbert, confuses Raymond Elwood Howard Lear (RayEL, Ra-el) with Rael who is The leader of the Raelian UFO Cult). This is an easy mistake to make as both share the same name and both are connected to UFOs. However, as you will see when you watch the above video and the following transcript that it is clear that Richard Shaw is referring to Raymond Lear (RayEl, Ra-el). Richard Shaw “He is one of several guys who thinks he is the Messiah. They have evolved the work of Rabbi Glazerson to prove that RayEL is really who he says he is, they did that in a round-about method. I don’t want to say that they were stretching the truth, but essentially they probably were. They actually even used a photo of Rabbi Glazerson on their own site and in their own publications as if Glazerson’s Torah Codes are proving that RayEL is who he says he is. Well, of course that did not make Rabbi Glazerson very happy at all. 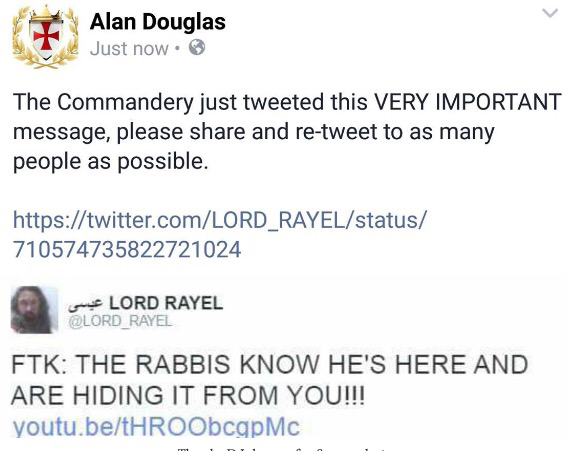 So he went and did a serious table on RayEL recently and sent it to me and it says Lord RayEL as that is what he calls himself, and attached to that at the bottom is the word liar, cheater and Amalakite. 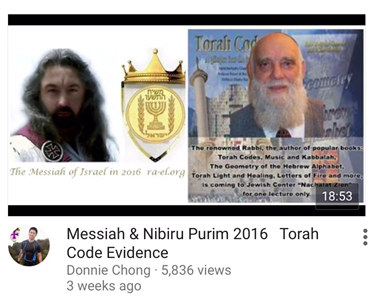 I have highlighted in previous blogs that the Ecumenical Order of Christ (EOC) have not only used Rabbi Glazerson Torah codes, but also his videos. 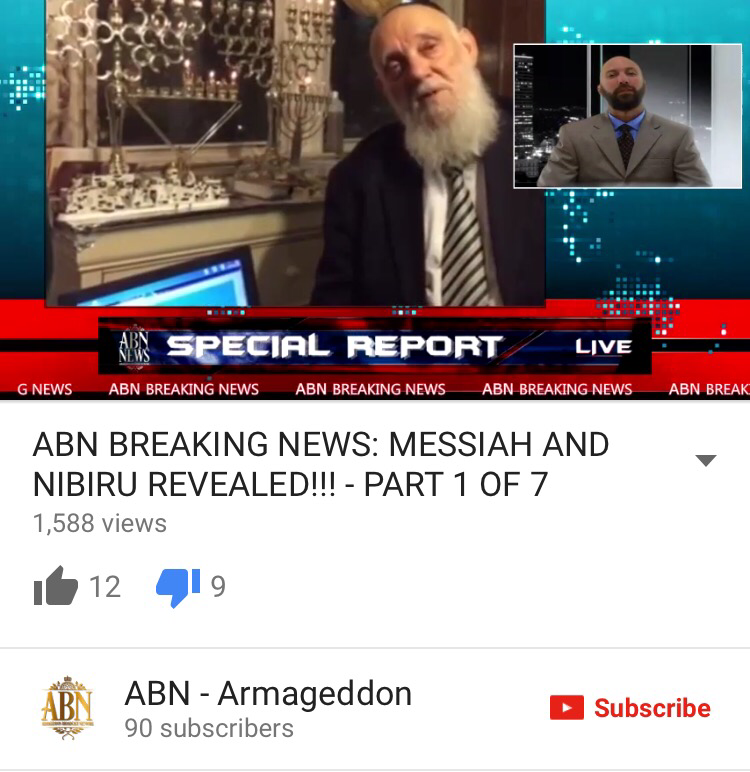 Very recently Armageddon Broadcast News which is hosted by the Ecumenical Order of Christ’s ‘Vicar General’ Kelly Patrick referred to Rabbi Glazerson’s Purim Codes and the coming Messiah fragrantly stating that they refer to Raymond Elwood Howard Lear (RayEL, Ra-el). Screen capture of Video released by Ecumenical Order of Christ that clearly shows Rabbi Glazerson. – Intellectual property of I love Jesus. During the same broadcast ‘Cardinal Kelly Patrick’ also intimated that many prominent Rabbis were acknowledging that the Moshiach is RayEl which is a total fabrication. This was shortly followed by The Imperial Regent and Knights Templar Alan Douglas posting…. If you have been following my blogs, you will know that the Ecumenical Order of Christ, continue to attack Rabbi Glazerson but use his works for their own cause. Next Next post: Richard Ruff attacks Richard Shaw and SkywatchTV.